Pulinckx’s education by J-B-C Corot is immediately obvious in his evocations of sylvan scenery, such as this one, often illuminated by passages of water – lakes, rivers and ponds, which catch and hold reflections of the sky and the cloudscapes above. He has not been influenced by Corot’s classicizing works, or by the late misty fantasies, but by the depictions of a realistic French countryside on the fringes of woodland, where a low horizon reveals signs of a busy rural life, and the light filters between tall tree trunks. Here the extreme flatness of the countryside appears to be Flemish rather than French, with scattered settlements of houses visible along the bends of river. The preoccupation of the figure in the rowing boat and the calm afternoon light beneath the high clouds give a Romantic cast to a scene which looks back beyond its realism to the pastoral idyll of Virgil’s Georgics. This painting, in a Salon frame and dated 1875, is almost certainly the work, or one of the works, Pulinckx showed at the Belgian Exposition générale des Beaux-Arts that year, and it follows that this beautifully detailed and richly moulded frame is the original setting. Louis Pulinckx was born in Antwerp, but trained in Paris as a pupil of Corot. subsequently working as a landscape artist in both France and Belgium. In 1874 he exhibited in London, and in 1875 at the Exposition générale des Beaux-Arts de Bruxelles. 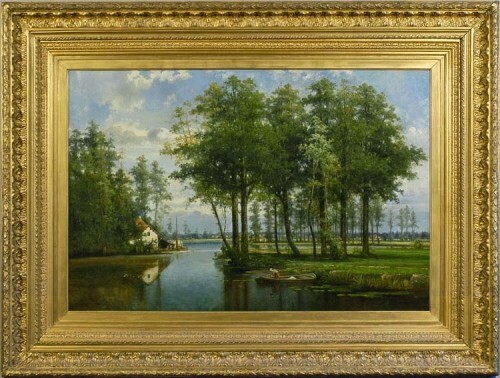 Following his master, his favourite subjects are forests and rivers, but he also produced figure paintings, genres scenes and pictures of animals. Works in public collections include A view on the Scheldt (London, the V & A ); and a painting in Liverpool, the Walker Art Gallery.